If you are redesigning your kitchen and want to include a kitchen island unit then the first question you need to ask yourself is ‘have I got room for one?’ If your kitchen really isn’t big enough then take a deep breath and scrap the idea as no matter how fantastic the island is it will cramp the space if the room is too small and the result will be a disaster. If you have the room however a kitchen island can turn even the best designed kitchens into something even more special. They are a great, practical addition from a cook’s perspective, and can be used for a multitude of purposes. These days they can also be designed to house all manner of exciting gadgets too. 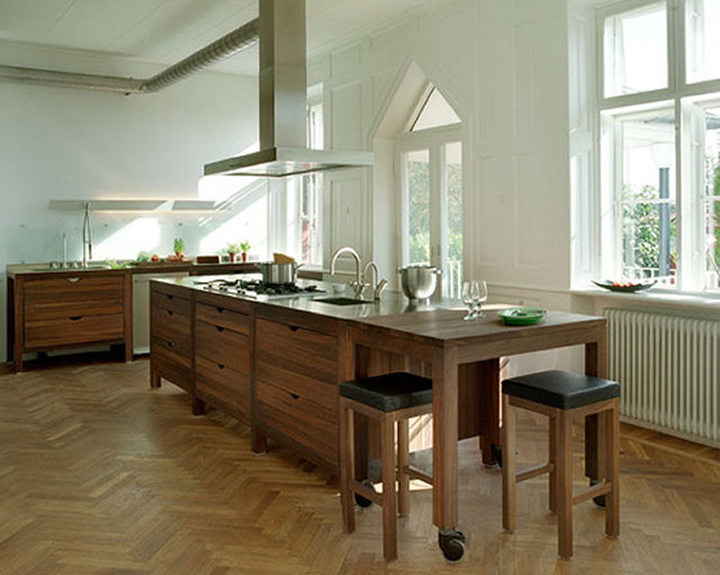 Before you decide on a design have a good think about what the island will be used for: do you want a breakfast bar? A sink or hob? Or just extra kitchen worktops for food preparation and maybe some useful storage. If you are including appliances which need to be plumbed in then work out if this is possible and if you will be cooking on your island think about an overhead extractor unit. Lighting is very important too especially for cooking and eating – you want to be able to see what you are doing so how will you light it? Once you are clear on your requirements then you can decide on height, size and shape. Look at softer, leaning-friendly curved edges if you envisage people hanging out at the island having a coffee for example, or maybe an L-shape to create a practical shape for budding chefs. Don’t forget to make sure the surface is high enough to sit to comfortably if you want to use bar stools, and an overhanging edge will be needed so there is somewhere to tuck your knees. Kitchen islands are a great way to personalise your kitchen space and make a great focal point. Plan yours properly and you will wonder how you ever managed without it.